This is q4wine options editor. You can change options which you enter in First startup wizard. Also you can customize q4wine theme and language locale, and use advanced q4wine options. Bin Wine binary loads and runs the given program, where the program is a DOS, Windows 3.x, or Win32 executable. Server Wine server is a daemon process that provides to Wine roughly the same services that the Windows kernel provides on Windows. Loader Specifies the path and name of the wine binary to use to launch new Windows processes. Libs (32 bit) Specifies the path in which to search for builtin dlls and Winelib applications. Set here path to wine 32 bit libs directory (if present). Usually it is /usr/lib32/wine. Libs (64 bit) Specifies the path in which to search for builtin dlls and Winelib applications. Set here path to wine 64 bit libs directory (if present). Usually it is /usr/lib64/wine. Use tray icon If this option selected, then q4wine will show it's tray icon. 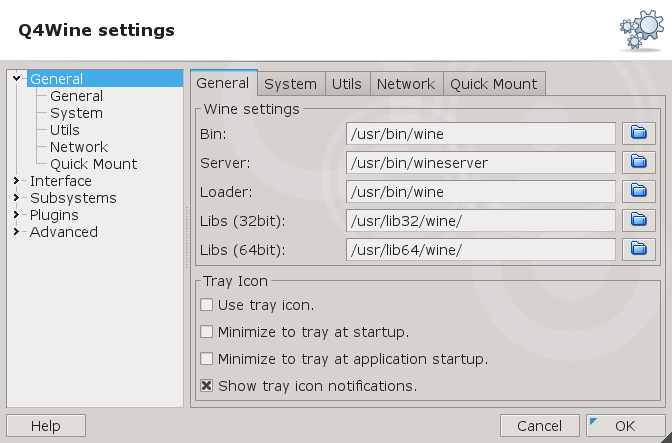 Minimize to tray at startup If this option selected, then q4wine will be minimized to tray icon at first startup. Minimize to tray at application startup If this option selected, then q4wine will be minimized to tray icon at program icon run. Show notifications If this option selected, then q4wine will show notifications at it's tray icon. Proxy settings will be used for winetriks installation process and q4wine network functions. Language Specify which locale will be used for user interface and online documentation. Themes Select q4wine icon themes. Enable logging subsystem This option will enable or disable logging subsystem, which allows you to log wine application output without running it in system's console. Clear logs at startup Because of sqlite engine specific, large amount of logging data can reduce q4wine performance. But if you wish, you can enable or disable database clear option here. Open application details in system browser Use system browser instead of set q4wine's widgets. Enable automatic generation of desktop menu If this option is enabled, then q4wine will manage q4wine's desktop menu tree. Update it on prefix, icon or direcotry changes. Remove desktop menu entries Remove q4wine's desktop menu tree. Default virtual desktop This value will be used by default for Run and Icon dialogs. Use single-click to run program icons. Use single-click to run q4wine program icons at "Programs" tab. Use the native file dialogs. By default, the KDE or GNOME native file dialog is used unless this option is unchecked. Note: Qt >= 4.5 required. Default directory for new wine prefixes. Use default directory path for new wine prefixes during prefix creation. Open run dialog If this option is enabled, then when You run recent icon, Q4Wine will open Run dialog before runs application. Import wine desktop file at q4wine startup If this option is enabled, then Q4Wine will scan for new wine desktop file at program startup. Remove processed wine desktop files If this option is enabled, then Q4Wine will remove all processed wine desktop files.